Check in with what we've been up to on the Eden campus and beyond. 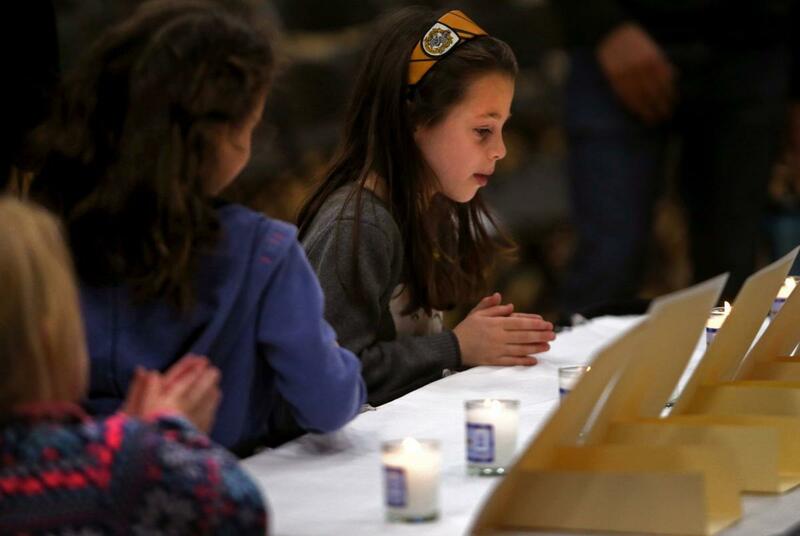 About 1,500 people gathered in the gym of the Staenberg Family Center in Creve Coeur to denounce violent acts of hate on Sunday, Oct. 28, 2018, at an interfaith vigil at the Jewish Community Center. The event followed Saturday’s deadly shooting that killed 11 people at a Pennsylvania synagogue. 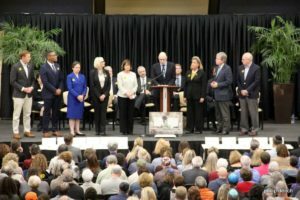 Speakers from area Muslim, and Christian congregations, including Eden Seminary, joined Jewish leaders to liken the acts committed against Jews at Tree of Life Synagogue in Pittsburgh to other recent attacks on groups singled out for their faith, race, ethnicity, country of origin or political ideology. 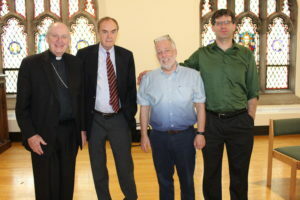 Because Eden Seminary plays an active role in the interfaith community in St. Louis, President David Greenhaw, as well as Eden alumni were included in the event. The speakers included Dr. Andrew Rehfeld who is the president and chief executive officer of Jewish Federation of St. Louis, U.S. Senator Roy Blunt, President Greenhaw and other religious leaders and politicians. In addition to the vigil, the Interfaith Partnership of Greater St. Louis issued the following statement on Sunday, Oct. 28, 2018. The Interfaith Partnership (IP) of Greater St. Louis and the 30 communities of religion and conscience we represent mourn the loss of life at the Tree of Life Congregation Synagogue on October 27, 2018. Those of us who pray, pray for the victims and their families, and offer our prayers of healing for the entire community wounded by this violence. Those of us who do not pray dedicate ourselves to work tirelessly to create a world in which attacks such as this never occur. Together we condemn this attack, like far too many other such attacks, made on our Jewish sisters, brothers, and friends. As a community of many faiths and none we continue to pray and will continue to work for the day when all people can live in peace and safety. 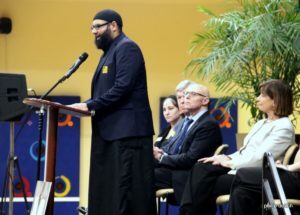 Interfaith Partnership of Greater St. Louis works with congregations and faith communities to promote peace, understanding and respect among people of all faiths and within the greater Saint Louis metro area. Eden Seminary is an active member of the IP and President Greenhaw is a member of the board. 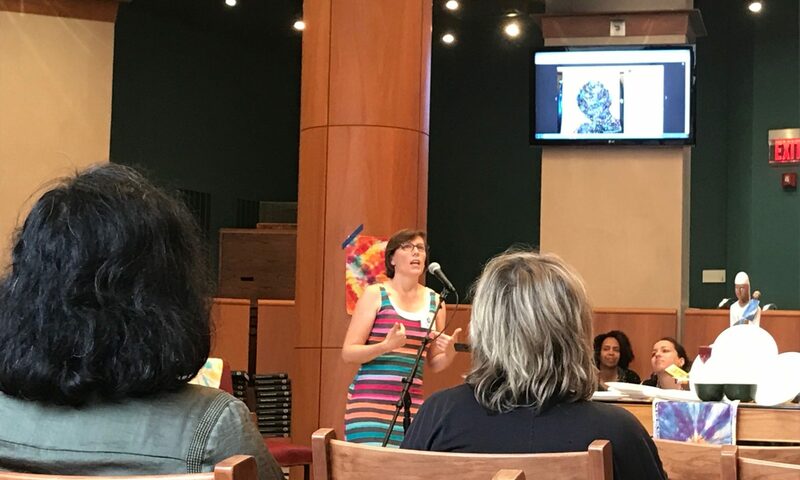 A week-long retreat channeled the creativity of artists and activists in the United Church of Christ in an effort to confront the world we live in today. 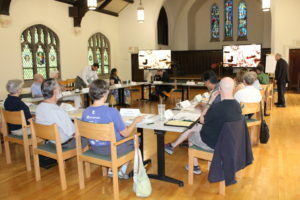 Nineteen participants, ecumenical partners and UCC clergy from across the wider Church, were welcomed to the National Setting and the Amistad Chapel in Cleveland, July 30-August 3. The group’s goal — to create a new and evolving language of faith for this moment in time that can be used to impact and resource local churches. “We know that our public witness and justice work is not separate from the formation of our faith and what happens inside of church buildings with our faith communities. However, there are still very few resources and practices that bridge these areas of ministry and community building,” said the Rev. Tracy Howe Wispelway, minister of Congregational and Community Engagement, Justice and Local Church Ministries. She and the Rev. 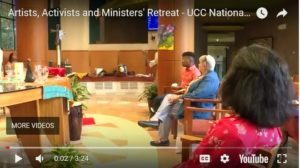 Susan Blain, minister for Faith Formation: Curator for Worship and Liturgical Arts, Local Church Ministries, convened the retreat. The gathering brought together spoken word poets and performers, liturgy scholars, designers and dancers, social activists and artists who work with painting and fabric art. Each of the participants was given the time and space to share their gifts with the group, through individual presentations, larger discussions, community meals, and worship. The Rev. Erin Beardemphl attended Eden Seminary, has served several churches in associations, and is currently a stay at home mom who fills in for her colleagues. An artist who works in watercolor, Beardemphl uses her current faith community in California, Redlands UCC, as a laboratory for worship experiments. She shared some of what she has learned with the group in her presentation Wednesday morning. Eden Theological Seminary has introduced a new program for professionals who have recently retired or are planning to retire and are exploring new purpose-filled engagement with their communities. 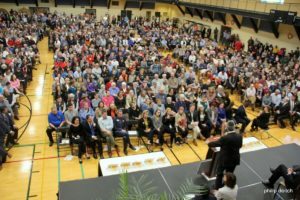 Called “NEXT Steps: Midlife and Beyond,” the program will meet a growing desire among baby boomers who are serious about transitioning their career experiences and talents to benefit causes of personal importance. Beginning on Sept. 13, subject matter experts will guide the first group of up to 15 participants, ages 55 and up, to self-discovery through seminar-style discussions, guest speakers, study, networking and opportunities to explore the nonprofit world through interviewing and volunteering. 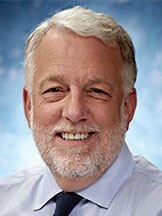 David Greenhaw, president of Eden Theological Seminary, will lead the fall session of NEXT Steps. Greenhaw, who regularly leads educational programs in St. Louis and beyond, has organized the program around the theme of vocation. Applications for the first participant group are due by Aug. 31. Sessions will take place on eight Thursday evenings from 6 to 9 p.m., from September through December, at the Walker Leadership Institute on the campus of Eden Seminary, 475 E. Lockwood Ave. in Webster Groves. The Rev. Dr. David Greenhaw is a preacher, teacher, scholar and theologian. Greenhaw, president of Eden Theological Seminary in Webster Groves and an ordained minister of the United Church of Christ, says many regular folks have too lofty a conception of the term ‘theology.’ “It’s just humans talking about God,” he says. In practice, however, Greenhaw notes that some clergy “talk at you about God. All human beings have to arrive at a concept of their own.” They must also arrive at a viable concept of their life’s work. Some people couldn’t imagine doing anything but devoting themselves to ‘the common good’ while supporting themselves and their families. But others work only to make enough money for a house with a two-car garage and two leased luxury vehicles, to send well-dressed kids to college and to play golf on the weekends. Then, retirement means they can play golf whenever they want. (But how much golf can one actually play after retirement? To some of you, that’s surely an impertinent question.) Greenhaw never keeps score. He only hopes to make a satisfying shot or two. If he shanks one, he just drops another one of the dozens he’s collected at the fringes of the Forest Park course during walks. Life’s too precious to spend looking for lost balls in the weeds. And at 63, near the age when many of us get the gold watch, Greenhaw has invented a program for professionals who have recently retired, or are planning to, and wish to infuse the rest of their lives with meaning. ‘NEXT Steps: Midlife and Beyond’ is designed for baby boomers serious about transitioning their career experience and talents to benefit the greater community. Beginning Sept.13, Greenhaw will guide the first 15 or so participants, age 55 and up, to self-discovery through seminar-style discussions, guest speakers, study, networking and opportunities to explore the nonprofit world. The eight sessions will be held from 6 to 9 p.m. on Thursdays September through December, and the first already has seven guests signed up and has reached ‘critical mass,’ Greenhaw notes. (Participants from all faith backgrounds are welcome and encouraged to apply.) 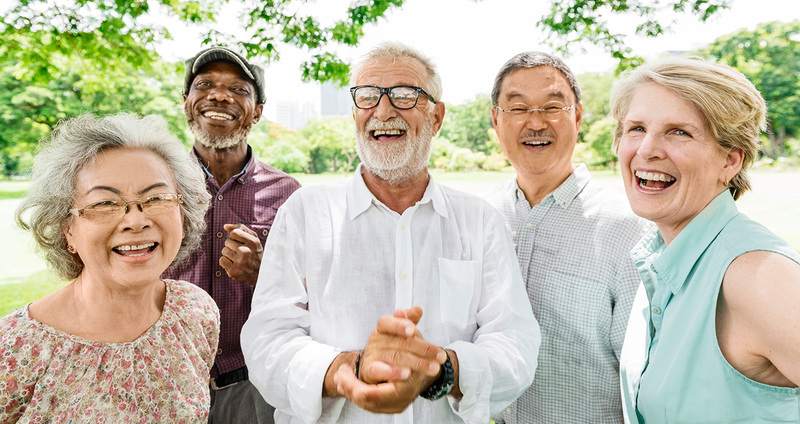 “A growing number of baby boomers seek new social purpose in their lives,” says program coordinator Dr. Janet Brown. Some seek to start nonprofits. NEXT Steps guest speakers will include theologians, social entrepreneurs, and leaders in the business and nonprofit worlds. The program will be held on the Eden campus at Walker Leadership Institute. The institute strives to equip business leaders with skills and experiences to guide their organizations in better serving the common good, partnering with other academic, religious and business groups to host workshops, conferences and forums to identify, encourage and activate community leadership. “Lots of people make financial plans for their retirement, but fewer make plans about who they will be and what they will do,” Greenhaw emphasizes. Applications for the first group are due by Aug. 31. Visit eden.edu for more details. In 1939, the MS St. Louis, a German ocean liner, attempted to dock in the United States so that passengers seeking asylum from Nazi Germany could disembark. The U.S. State Department turned them away. Of more than 900 passengers, 254 were murdered; most were killed in Nazi concentration camps. Last week, on the steps of the International Institute of St. Louis, a service of remembrance was held. Here, in the city sharing a name with the ill-fated ship, women and men from many faiths and nations gathered to keep mindful of this tragic history. Each of those rejected from America’s shores and subsequently killed by Nazis were memorialized, as the place of their murder was read aloud. Near the end of the service, those gathered chanted “never again.” I was among those chanting. Yet even as I said “never again,” I felt dishonest — dishonest because we are right now doing it again. The U.S. government is turning away thousands of refugees, forcing them to return home, where dangerous and often deadly futures await. Our immigration policy is as mean-spirited and unwelcoming as it was in 1939. While I am glad for those who commit themselves to “never again,” in our time the call must be: Stop turning away our neighbors in need; find ways to be welcoming. June 6, 2018 – Webster Groves, Mo. Change doesn’t come easy, yet Rev. Musa Maina of Kenya recently helped achieve a milestone transformation in the Reformed Church of East Africa (RCEA). For the first time in the church’s history, women are approved to be ordained ministers in the church. “We continue on the path of female vocational calling with the first female ordination planned for July 2018,” he says. “Notices have been sent, and I feel a strong sense of God’s presence and God,” he says. Rev. Maina attributes this progressive church advancement, in part, to the insight he gained while studying at Eden Theological Seminary, Webster Groves, Mo. “We owe this to God who in Revelation 21:3, makes a dwelling place among people. I owe the boldness to the formation I received especially at Eden. Whatever lies ahead, one thing I know for sure is that I have no apologies over it,” says Rev. Maina. This realization fueled Rev. Mania’s process of transforming church politics to ordain women minsters. While already a pastor and faculty member of the Reformed Institute of Theological Training (RITT) in Kenya, Maina decided to further pursue his religious education at Eden. He earned a Master’s Degree in Theological Studies (MTS), graduating in 2005. Thus, began the long path Maina followed to change RCEA policy on women as ministers. Eden Theological Seminary is a graduate school preparing women and men for ordained Christian ministry. One of six seminaries of the United Church of Christ, the Eden community is committed to advancing the greater good. The school welcomes everyone, regardless of denomination, gender, race or background. 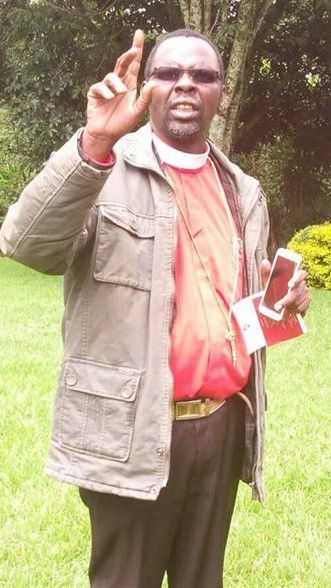 After returning to Kenya, Rev. Maina continued his leadership role in RITT and worked as a moderator for the RCEA. The partnership of RITT/RCEA and Eden allowed him to collaborate and engage the RCEA in new progressive ideas that were more inclusive of women as preachers and worship leaders. 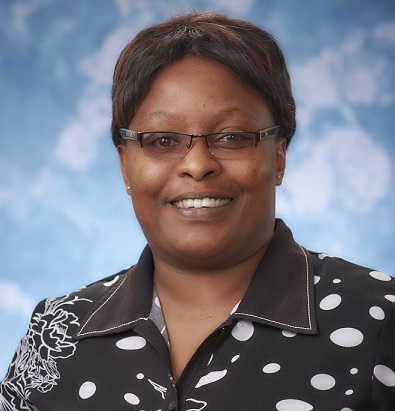 His efforts, with support from Eden and others, resulted in the first RCEA woman, Everlyne Biboko, to attend Eden and earn a MTS degree to prepare for ordination in the RCEA church. David Greenhaw, Eden Theological Seminary president and professor of preaching and worship, says, “While at Eden, Rev. Maina used our program to help expand his knowledge of critical biblical interpretation. It also exposed him to women in leadership roles in many U.S. churches. “Our program provides a religious education with a global scope, yet it’s intimate in setting,” says Greenhaw. “Students live, learn and worship alongside classmates from diverse backgrounds. We help establish a career path for our students through a family of faculty mentors and other students from across the U.S. and the world. Enrollment in the Eden graduate programs ranges from 160 to 200 students. In 2017, the entering class consisted of a 50-50 ratio of gender and race from multiple Christian denominations. Student ages range from those in their 20’s to those in their 60’s and 70’s. It’s a diverse student base for exploring different theologies and interpretive approaches. Deborah Krause, dean of Eden Theological Seminary, describes the educational experience at Eden as partnership between faculty, students and global communities. Sharing knowledge and developing friendships within the global community helped pave the way for the sort of transformation that Maina pursued. During a sabbatical to Kenya, Krause also broadened her friendships and experienced a knowledge exchange that enriched her work as a teacher of Biblical interpretation. While Krause was in Kenya, she and Rev. Maina visited many churches where she was invited to preach and lead worship. “This was an opportunity for me to learn about the RCEA and for Rev. Maina to engage the church with an example of women’s leadership,” says Krause. Ultimately, the Eden mission is simple, says Eden president Greenhaw. “When you look around at towns, communities and countries around the world, you see the influence of the Christian church. Not just in congregations, but in hospitals, nursing homes, schools and outreach ministries of many kinds. The church makes its mark every day. 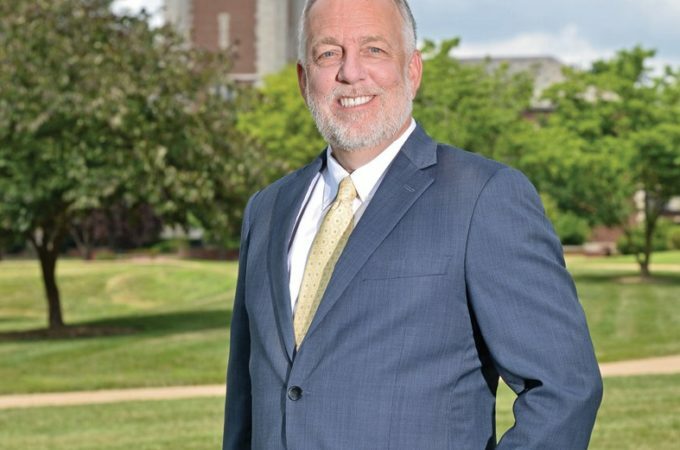 The Louisville Seminary Board of Trustees voted June 7 to appoint the Rev. Dr. Alton B. Pollard III as president. 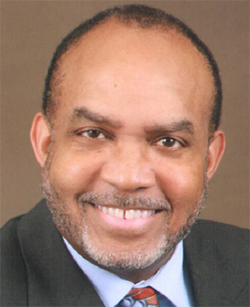 A scholar, author, consultant and speaker on the subject of African American religion and culture, Pollard was previously dean of the School of Divinity and professor of Religion and Culture at Howard University in Washington, D.C.
Pollard said he was drawn both by the history and the current trajectory of Louisville Seminary. Prior to his eleven years at Howard University, Pollard served as director of Black Church Studies and chair of American Religious Cultures at Emory University, and taught at Wake Forest University and St. Olaf College. He earned degrees from Duke University, Harvard University Divinity School and Fisk University. Pollard has authored, co-authored and edited a number of books and journal articles. He serves on the Board of Directors for the In Trust Center for Theological Schools and the Advisory Committee for the Luce Fund for Theological Education. He served on the Board of Commissioners for the Association of Theological Schools from 2010-2016 and was chair from 2014-2016. A native of St. Paul, Minnesota, Pollard and his wife Jessica have two adult children. Current Seminary President Rev. Dr. Michael Jinkins announced his retirement in April 2017. Pollard will begin work as president at the start of the fall semester this September and will be formally inaugurated in spring 2019. 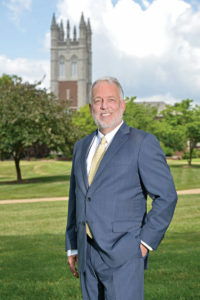 Pollard’s appointment follows a national search conducted by a presidential search committee including several Seminary trustees, faculty members, and other seminary constituents and led by Board Chair Lant B. Davis of Birmingham, Alabama. Jinkins will continue to serve as president until September 2. During his eight-year tenure, Louisville Seminary launched its bold Covenant for the Future vision which made full-tuition scholarships available for every master’s degree student and, by 2021, will provide stipends for living expenses. The only seminary in the country to offer this benefit, Louisville Seminary students participating in the scholarship “pay the debt forward” by engaging in learning and service opportunities that enhance their opportunities for leadership in church and non-profit sectors. The Conference on Drone Warfare was held at Eden Theological Seminary on Friday, June 8, 2018, co-sponsored by Eden Theological Seminary and the Interfaith Conference on Drone Warfare. It was attended by about 30 people of faith. It explored why many people of faith believe that the use of lethal drones should be limited or ended. 1. Because lethal drones are so easy to use, it is tempting to expand warfare into non-war zones thereby increasing the likelihood that the U.S. will resort to war. 2. Though it is possible to kill terrorist leaders with lethal drones, drones cannot kill an extremist movement. In fact, the opposite is likely – drone attacks increase the determination of the terrorist and increases the number of extremists. 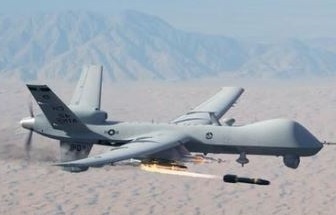 There is an expression that says “Kill a terrorist; create ten more.” Drones do not kill violent ideology; they generate hatred and mistrust of America. 3. Though the number of civilian casualties, including children, may be smaller than those resulting from the use of other weapons, the weapon is not as precise as the government claims. 4. Drones are proliferating. More than 80 countries currently have lethal drones. It is increasingly likely that lethal drones will be used against the U.S. The world urgently needs strong international agreement banning or limiting the use of lethal drones. 5. The use of drones is not transparent. The U.S. government has kept much of this program secret. There is a disconnection between what Americans know and what the government is doing. It is difficult for Americans to publicly criticize drone warfare because they have very little information. When information has been made public because of litigation, policies have changed. 6. The use of drones directly harms attempts to promote human rights and the rule of law by violating international human rights law. 7. Terrorist groups, like ISIS, now use lethal drones. 8. Though drone operators cannot be killed or physically wounded, they are often damaged psychologically and some have been diagnosed with Posttraumatic Stress Disorder (PTSD). 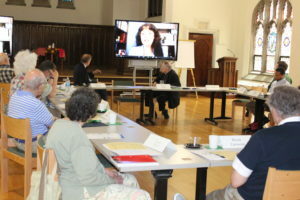 The Interfaith Network on Drone Warfare grew out of two developments: the formation of the DC-based Interfaith Working Group on Drone Warfare with many faith groups participating in spring 2014; and the first Interfaith Conference on Drone Warfare in January 2015 at Princeton Theological Seminary, facilitated by the Princeton-based Peace Action Education Fund. The Network is continuing the work in the faith community, seeking to deepen understanding and bring significant spiritual insight to that emerging major issue. In a cooperative arrangement with United Theological Seminary of the Twin Cities, Eden Theological Seminary in St. Louis has appointed Dr. Sharon Tan as Eden’s Acting Dean for the 2018-2019 academic year. Dr. Tan serves as the Vice President for Academic Strategy at United Seminary and will take a leave from United to serve at Eden. Her responsibilities at Eden will include leadership of the educational programs, assistance during two upcoming accreditation visits, and furthering the strategic plans of both schools. United’s commitment to educate innovative and compassionate leaders has recently been strengthened by their plan to relocate to a new urban campus in Saint Paul. Eden continues a tradition of education for authorized ministries in the U.S. and globally, while exploring new leadership programs, particularly through the recently founded Walker Leadership Institute. • Strengthen the relationship between our churches and these seminaries. • Further the mission and work of these seminaries. • Provide financial support for these seminaries. 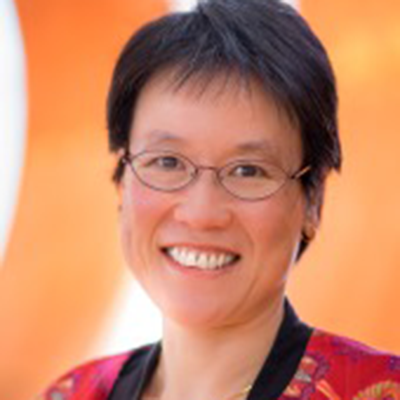 Dr. Tan holds both JD and PhD degrees from Emory University, and served as United’s academic dean before assuming her present position. She is a teacher and scholar in theological ethics, with specialties in Asian American Christian ethics, comparative religious ethics, justice, reconciliation and religious studies. Dr. Tan’s published works include the book, The Reconciliation of Races and Classes: How Religion Contributes to Politics and Law. During her time in the United States while away from her home in Kenya, the Rev. Angela Kamuyu has made the St. Mark Presbyterian Church, in Ballwin, Missouri, her church home away from home. She began attending St. Mark in September 2016 when she began her advance degree studies at Eden Seminary in Webster Groves. Pastor Angela’s time with St. Mark has afforded her the opportunity to learn more about how networking, church organization and hospitality influence a congregation’s growth. In turn, she hopes to leave something behind for her St. Mark family: “A friendship bond that will connect two worlds and continue even in the future.” She will be preaching here sometime this spring, before she returns home. As a child growing up in Kenya, Pastor Angela Kamuyu had a passion for helping others, and eventually found the perfect platform: service to her church. “I longed to be in the holy ministry, reaching the unreached with the word and serving through the gospel, as it would fulfill that desire for me,” Pastor Angela said. In her native country, Pastor Angela serves with the Presbyterian Church Of East Africa (PCEA) which partners with PCUSA to which St. Mark belongs. The Presbyterian Church, of East Africa primarily covers Kenya, Uganda and Tanzania and is the second largest denomination in Kenya. The size of the Kenyan church congregations vary depending on location, ranging from a single congregation of a thousand or more, to several hundred, to a small congregation of tens. Though the size may vary, all churches share a single purpose: to fulfill the duties of the word and the sacrament. Pastor Angela has served several congregations at the same time, on a regular, rotating schedule. “Besides spiritual welfare, our church works to help the less fortunate in the society and in the areas of health, education and the environment, and teaming with other institutions, like prisons,” Pastor Angela says. Just as Pastor Angela’s drive to help others led her to a life of service with the Presbyterian church, her basic need to move beyond her comfort zone brought her to another continent. Armed with a scholarship and a desire to develop a deeper understanding of the Old Testament through the context of a different culture, Pastor Angela came to the Eden Seminary in St. Louis to study. When she completes her master’s degree in theology, Pastor Angela plans to return to Kenya with new ways to contribute, not only to her own congregation, but to the larger church system. She will graduate with a Master’s degree from Eden Seminary on May 18. Among the challenges Pastor Angela will face when she returns home is overcoming the belief that women do not belong in positions of power in the church. “Women’s representation in church is minimal,” she says. “They are not in the hierarchical structure—not in the top helm position. More should be done to encourage women’s participation in the church decision-making in general and inclusion in the top officials of the church.” Angela serves in Presbyterian Church of East Africa, which is associated with the PC-USA. It is an ongoing process, Pastor Angela says, to educate Christians that women can bring about social change and change societal structures and institutions for the better. “It is a bid to change the historical patriarchy and better appreciate women’s identity and to accept women of authority—which at times is not fully embraced, barely recognized or looked down upon,” Pastor Angela explains. 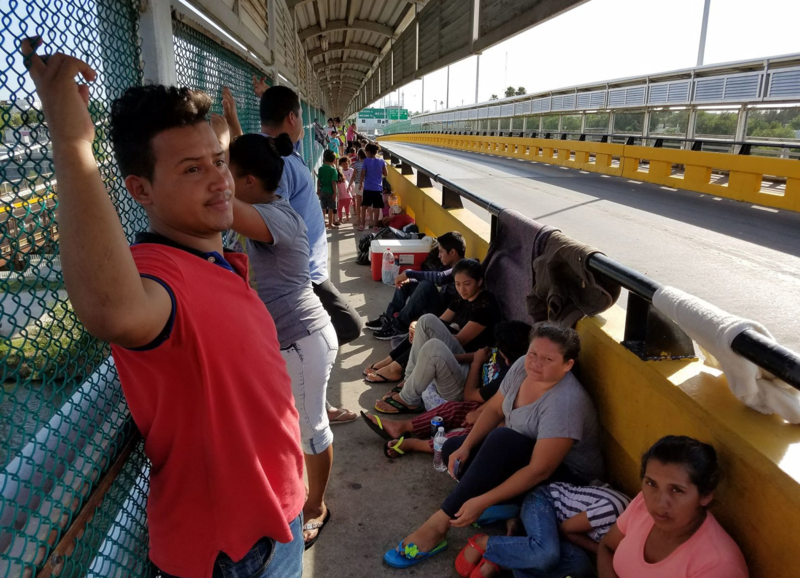 The struggle to assume leadership roles is one that is familiar to many women in the United States, as well, but Pastor Angela offers hope for those working to make inroads in both countries. Her Master’s dissertation is: “Appreciating the contribution of women in leadership roles through the example of prophet Huldah,” based on scripture in II Kings 22. Pastor Angela’s theological interests also include the role that Christians can play in environmental stewardship. In the future, she hopes to see churches develop alongside other groups, companies and organizations in advancing environmental initiatives. On a broad scale, she would also like to see churches provide multi-generational outreach programs to help promote a greener, safer environment. Tools that St. Mark might consider include creation of a “green” check list; adoption of water and energy conservation programs; programs and church services about protecting our natural resources; use of more local, recycled or upcycled materials; and partnerships with local environmental organizations. Pastor Angela’s visit to the United States comes at a time of great political dialogue on the subject of immigration. As Christians, she says we have the ability to lead that conversation. “The church leaders have a great influence at the negotiation and dialogue table with the government,” she says. Join us in our work for the common good.